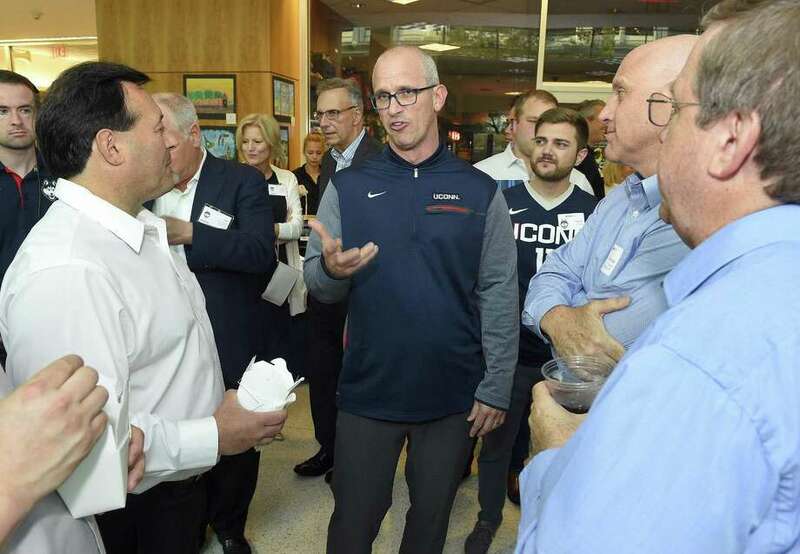 UConn men's basketball coach Dan Hurley chats with fans during the inaugural UConn Huskies Coaches Road Show visit to the campus of UConn Stamford on June 7, 2018. 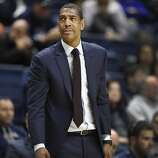 Four games in the New York City metro area, three at Madison Square Garden, two Jim Boeheims, one defending national champion and plenty of familiar foes will highlight UConn’s non-conference schedule this season. UConn will face Villanova in the second of a three-game series with the Wildcats on Dec. 22 at Madison Square Garden. Villanova crushed the Huskies 81-61 in Hartford on Jan. 20 en route to its second national title in three seasons. The Wildcats lost four integral players — Omari Spellman, Jalen Brunson, Mikal Bridges and Donte DiVincenzo — to the NBA draft, but they still should be strong thanks to some veteran returnees and a top-notch recruiting class. UConn will face former Big East foe Syracuse for the fourth straight year, and for the third consecutive year at MSG. The Huskies and Orange will clash on Nov. 15 in a 2K Classic game. 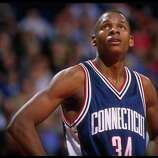 UConn is 1-2 against the Orange since the dissolution of the Big East. Syracuse figures to be strong this season, with the somewhat surprising decision of top scorer Tyus Battle to eschew the NBA draft and return to school. The Orange also have Oshae Brissett and Frank Howard back after a surprise run to the Sweet 16 in March. UConn will face either Oregon or Iowa in another 2K Classic game the following night, Nov. 16, again at MSG. If the Huskies face Oregon, it will be the third straight season the teams will have met. UConn lost to the Ducks 79-69 at the Maui Invitational in 2016, but rebounded with a 71-63 win at the PK80 Invitational last November in Portland, Ore. — one of UConn’s few decent victories last season. On Dec. 2, UConn will host Arizona in the second game of a home-and-home series with the Wildcats. The Huskies were topped 73-58 last Dec. 21 in Tucson. Arizona was one of the most talented — if underachieving — teams in the nation last season, but it has lost six players to graduation or to the NBA draft, including Deandre Ayton, as well as Allonzo Trier, Rawle Alkins, Parker Jackson-Cartwright and Dusan Ristic (who burned the Huskies for 18 points last season). In another metro New York game, UConn will face Florida State as part of the Never Forget Games at the Prudential Center in Newark, N.J. on Dec. 8. The Seminoles have three starters back from last year’s 23-12 team that lost to eventual national runner-up Michigan in the Elite Eight, including talented guard Terance Mann and forward Phil Cofer. UConn’s other six non-conference games (all at home) will be against Drexel (Dec. 18), New Hampshire (Nov. 24), Cornell (Nov. 20), UMass-Lowell (Nov. 27), Morehead State (Nov. 8), UMKC (Nov. 11), Lafayette (Dec. 5) and Manhattan (Dec. 15). UNH, an America East team, boasts East Catholic product Mark Carbone of Wethersfield. Carbone played at San Diego as a freshman before transferring and sitting out at UNH last season. Cornell features Jimmy Boeheim, son of Syracuse’s Hall of Fame head coach. Morehead State and UMKC are both 2K Classic regional games that will be played in either Storrs or Hartford. Even if UConn loses one of those games, it will still advance to MSG to face Syracuse on Nov. 15. The American Athletic Conference also released conference opponents recently. UConn will play host to Houston and Tulane and travel to Memphis and Tulsa. The Huskies play UCF, Cincinnati, ECU, USF, SMU, Temple, and Wichita State twice. Game times and venues for these games will be announced at a later date.